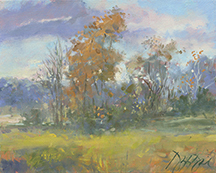 Start fresh as a complete beginner in oils or put what you learned in Douglas’ earlier classes to work in this marvelous Landscape Workshop. 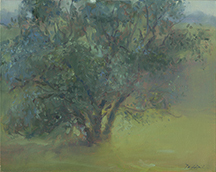 Class will cover the basic principles of oil painting with regard to landscape painting. Painting out-of-doors, en plein-air will be a major focus of the study after the basics are covered. Discussions and lectures on basic composition, massing, building form, light and shadow, near and far, capturing and developing atmospheric distance and depending on your own style, knowing when a work is finished (learning how to not overwork you painting). Students will work in their own style/technique so that the finished work is their own. Douglas will overview his palette and concepts his work entails. After a brief morning intro and a time to mix palettes and pare down materials, Douglas will have students painting in Glen Miller Park by lunchtime on the first day. Students will work on small canvases and the emphasis will be on capturing the time of day, atmosphere and geographical elements in Richmond’s Glen Miller Park in a quick concise way based on the covered principles. Douglas will help students pare down equipment so only the necessities are taken out of doors. The same general area will be the basis for both days. Depending on the skill level of each student, students are able to grow and develop at a rate that is to their comfort. Demos and individual discussions/instruction will help each student to begin to reach the preliminary goals they are striving to meet. Plan to produce several studies and at least one larger painting. Plan to bring notebook/sketchbook and enjoy some demos along with some great stories to help you remember these principles that are the foundation of Douglas’ teaching. 2nd hour: Mix Palette (Strings of color/organize for painting out of doors). Lunch: Grab sandwich on way outside. Afternoon: On location - everyone painting out of doors. 1st half hour: Brief review in studio. Lunch: Best to brown bag on these workshop days and to break as a group and picnic in shade. Last hour / in the park: Review each student’s work and accomplishments during condensed workshop.